The Perfect backpack for any first responder has 7 compartments which are all easily accessible and can be found quickly. Constructed of tough PVC material this pack will last you many years of tough use. 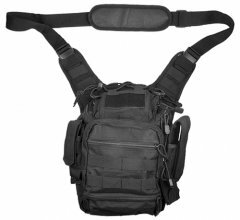 The carry strap is adjustable to fit any size or frame and has a shoulder pad to ease stress on the user. A breathable mesh backing is perfect for any condition hot or cold. The pack has a concealed carry pocket in the rear. PALS webbing is included on the front, sides, and bottom as well as velcro patches to accommodate any type of accessories you may need to get the job done. Any first responder in the field today will tell you this is the pack to have! Rear concealed Carry Pocket (Holster not included) in several variations for easy access of your Conceal Carry Pistol. Velcro Patches to accommodate Hook and Loop accessories. One Rifle and Two Pistol Magazine Pouches. PALS Webbing on Front, Sides and Bottom to add anything you need to get the job done. Removable and Adjustable Carry Strap with Shoulder Pad.